How to grow both mental and emotionally through taking full charge of your brain processes. Varied and well researched ideas related to writers of positive motivation books particularly in regards to self confidence & mind control shall be considered throughout the eBook. Here, several principles as well as factors that are tied to identifying the power within you through mind control will thoroughly be discussed. Researchers have proved that fine-tuning your mind and focusing deeply on certain relative phenomena will drastically improve your memory capabilities. The author delves into the broad topic of personal growth which is fully realized when ones memory is functioning at optimum capacity. 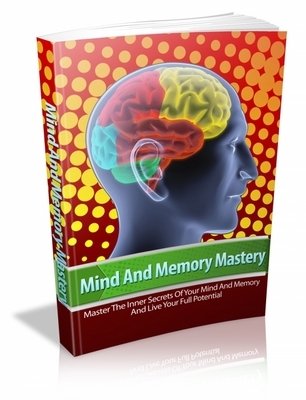 Mind And Memory Mastery will assist readers unfold their full potential through achieving personal goals and objectives. It will further help one overcome constant worries such as remembering peoples names, crucial meetings and also certain assignments. This eBook shall further give you relative insight concerning basic lifestyle skills that will boost sharpness of your mind. Students, public speakers and other professionals who entirely depend on the power of memory will find precious information in this book. Loss of memory is a very sad state that can make others quickly lose interest in you as they may assume that you are not an attentive listener. However, this may not be true since your memory malfunction may be rooted to clinical reasons such as psychological duress. Reading Mind And Memory Mastery eBook will give you great insight in regards to practical ways you can deal with such mind drawbacks. Researchers have identified that memory loss can be related to other malfunctions such as incoherent speech. These can further lead to stress and low self esteem when the person feels like he/she is not communicating effectively to significant others. Mind And Memory Mastery will present the reader with relevant deep meditation skills that will be of great benefit for those in search of their true spiritual self. You will master the art of mental relaxation which is vital in clearing away unwanted thoughts from your memory, thereby making you sharper. Make thoughts running through your mind serene by letting them flow but dont be over-attached onto them. Concentrate on your main purpose. Ensure that there arent any distractions nearby. A distressed environment shall be impeding to your own mental progress. On the other hand, a serene and calm environment shall give the best results.